After my recent research into what mechanical changes Nissan had made to the R34 vs the R33, and finding that basically, other than aerodynamic improvements, a lot of effort was put into improving body rigidity, I began to think about what I could do to improve the rigidity of my car. Granted, it’s a Series 3 so there already is additional factory bracing in the rear trunk area, and I have already installed the Nismo underfloor bracing (both front and midsection), but what else is there? Obviously, a roll cage is one solution, but I want the solution to be invisible. I have heard of foam that you pour in that hardens when it dries, but I have also heard that it can trap moisture, leading to rust, and that if not done properly it can, upon expansion, distort the sheet metal around it! Also, some people point out that it could cause the body to act in weird ways during a crash. Spot welding is another option, but that of course should be undertaken with a full repaint, if you want to do it properly (although I will be looking into this). So, my choices at the moment are limited to bolt on braces. I searched on Minkara, the popular Japanese car-related website, in their “Parts Review” section (where readers post their reviews of parts), and found one part that received universal praise, and almost always the full 5 stars (out of 5 stars). The Gacchiri Support from Nagisa Auto. Nagisa Auto is an Osaka based tuner that specializes in various small parts, but mostly suspension and body rigidity items. Anyway, I’ve only driven the car a short distance, that is back from my tuner. And yet, in the few kilometers back home, I DID feel a difference. It’s somewhat hard to describe, but basically, the car feels more responsive to steering input, and strangely, it feels smaller. This weekend I may be attending an event on a track, in which case I will be able to get a better feel for this, so will update in my next post! So it's taken me almost 7 years (I've been procrastinating ever since I bought my GT-R) and less than $100 (US), to finally get the license plate I always wanted. Unoriginal, perhaps, but what else could I have done? In Japan, certain personalized numbers are granted only by way of a lottery system. Lucky numbers like "55" and "88 88" for example. And, for some reason, "33" ... but NOT "32" or "34" or "35".... huh? So it wasn't as simple as going down to the department of motor vehicles and filling out an application. That was the last step. First, I had to "win" the lottery for this number - and that took 3 tries, at 2 week intervals. Then, in Japan, you have to show proof of all of your past addresses if the number plate you are applying for replaces one which was registered at a different address. Oh, and I also had to have the police come over and issue a verification that I have a parking spot! Anyway, my tuner volunteered to go through the paperwork nightmare and took care of this for me at minimum cost and hassle to me. 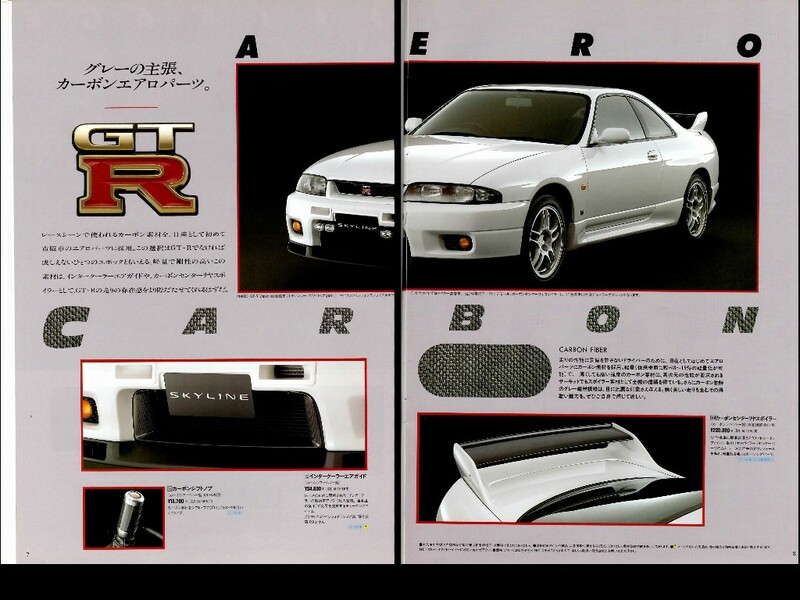 Following up from my previous two posts which covered the exterior and interior options available for the 1995 R33 cars (with emphasis on the GT-R, of course), I managed to get ahold of the catalogs for the 1996 and 1997 R33 cars (and my apologies for the one page scans, my home scanner does one page at a time only, will try to find a larger scanner soon). 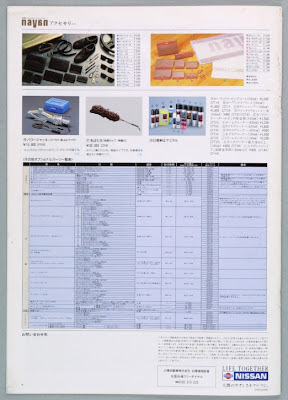 Let’s start by looking at the 1996 catalog. On the pages exclusive to the GT-R (pages 7-10), two new options – a carbon fiber shift knob, and a new exhaust from Nismo. Everything else, we've seen before in the 1995 catalog. (with the asymmetrical ducting), and the Momo steering wheel with airbag. Forged aluminum wheel sold by ALTIA - or actually, as it was known then, "Nissan ALTIA" as it was a subsidiary of Nissan. Back then, ALTIA was involved in racing and had various aftermarket GT-R parts, but now is essentially a parts/tools manufacturer. Time moves on, I guess. I'll try to hunt down some old Nismo catalogs, that might be interesting... but for now... finally back to some new parts for my car! Stay tuned! So what about options for the interior of your R33? 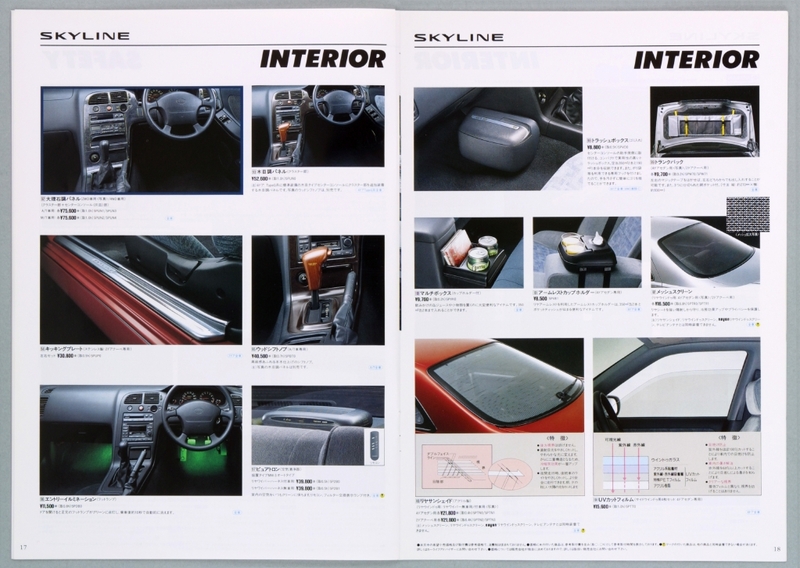 I’ve always enjoyed looking at Japanese car catalogs, as there are some crazy options out there… yes, those ubiquitous lace car seat covers, to other more interesting stuff…in any case, continuing from my last post here is a selection of stuff for the 1995 Skyline GT-R, taken out of the general R33 OEM options catalog. On this page, the other options available for the GT-R were the manual transmission shift knob for 14,300 yen, the oil filler cap, and the foot rest. Nothing else was offered for the GT-R. I would kill for the “multi-box” but so I could offer drinks to my rear passengers but perhaps I first need to get either a meshed rear screen or have my windows tinted. Ah, never mind on that one. Actually I have seen only once – on a car offered by Newera – the Trunk Bag. Maybe I should have swiped it, but honestly it looked like it could not hold too much. Hopefully the 1996 and 1997 catalogs will contain some other cool things? Stay tuned for my final post on OEM options! Well as I suspect most of us did not purchase our cars new from the dealer in Japan (maybe some of you were lucky to buy new in the UK? ), we had little say in how our cars were optioned, either from the factory or at the dealership. 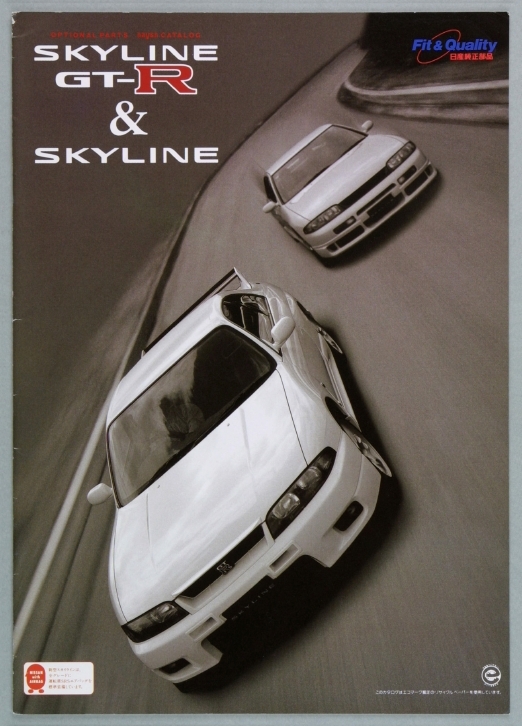 Recently, I’ve had a couple of people (R33 friends, of course) ask me about certain optional parts on the R33…which inspired me to dig into some old catalogs I happen to have, to find the OEM Options Catalog for the Series 1 R33 GT-R (stay tuned for reviews on the Series 2 and Series 3 option catalogs). Also, just to note this catalog is what the dealers offered as NISSAN parts. 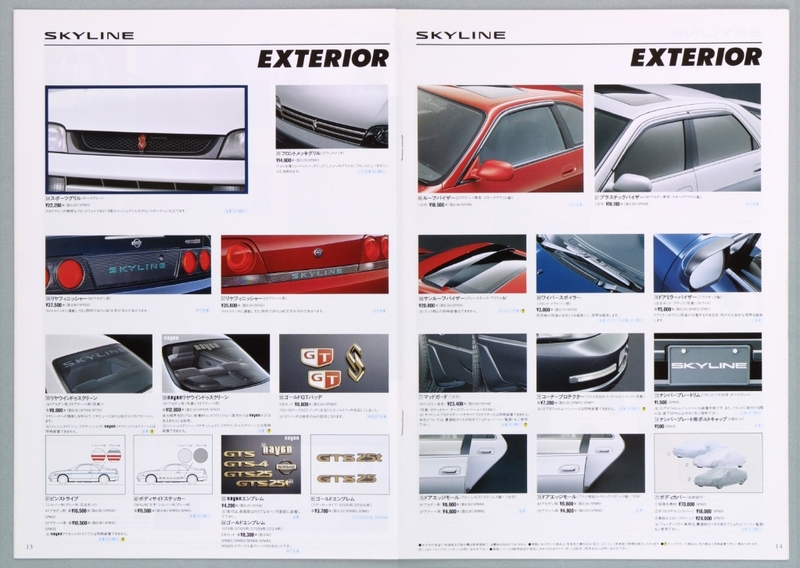 There was a separate catalog for NISMO parts. Of course I will hunt these down for a future post. 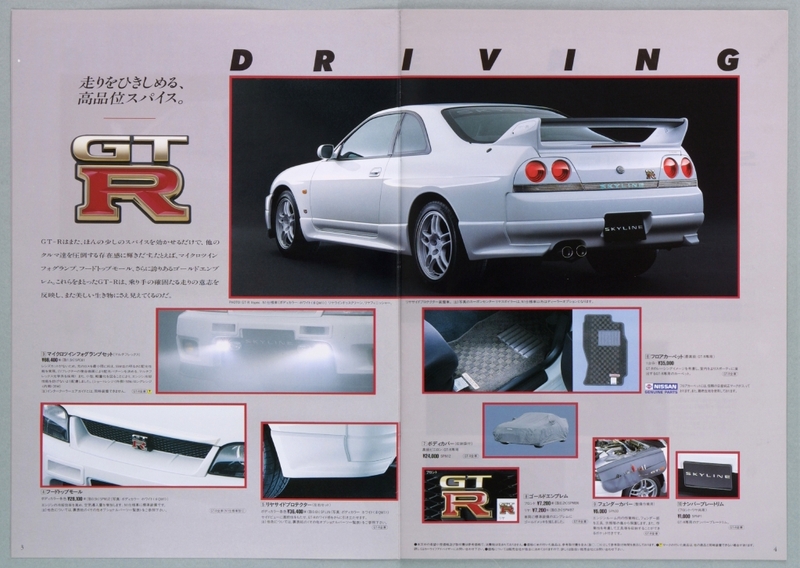 Anyway, in order to keep it simple, this post will highlight options for the EXTERIOR only and for the 1995 GT-R. My next post will be for interior options. Page 1-2 – “Carbon” – Two carbon options were offered – an intercooler air guide, and an all carbon, rear spoiler blade. The intercooler air guide I think works only with standard sized intercoolers (at least that is the description) so if you run a larger, thicker intercooler some clever rigging might be needed. Note that the spoiler blade has a built in “lip” that the stock blade does not. This is a Gurney flap. Google it, there are lots of explanations out there why this is better than a standard flat spoiler. 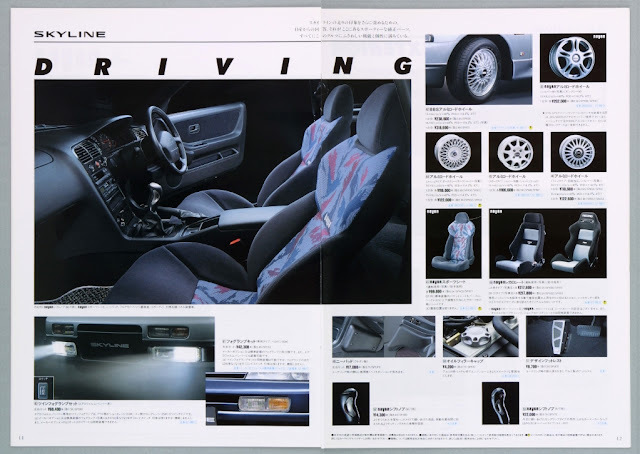 Page 3-4 – “Driving” – well these are your more typical options. I think almost every GT-R I’ve seen has the floor mats, so it’s surprising these were an extra pay option. You can tell the technology and fashion of the time by the types of options. Who in their right mind (now) would want a set of foglights that required 4 separate housings? And the gold plated GT-R emblem… well, let’s just say I don’t see many of those. But those “Rear Side Protectors” (the spats on the rear bumper) are a worthwhile option – I have those on my car… and arguably, so is the “Hood Top Mole” which I believe uses the Bernoulli principle to actually force more air under the hood. Other than these items, it appears that all other options available for the GT-R were those also available for the standard R33. 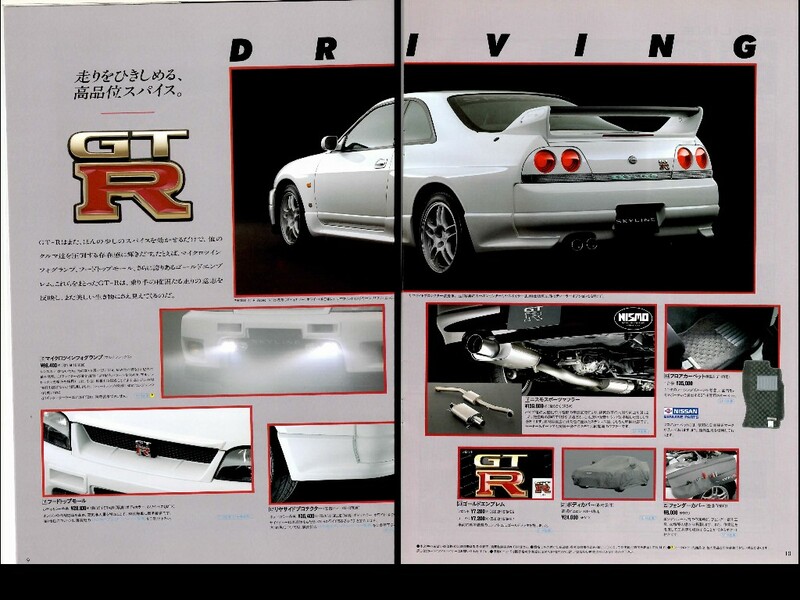 For example, on pages 9-10 – the only options that were available on these pages applicable to the GT-R are the bicycle/ski/roof racks, but I have never seen a GT-R with these fitted. Has anyone? Then on pages 13-14 – again we have the gold GT badges. Honestly not my cup of tea, but they actually might look pretty good on a black or red car? For those who really want to MAKE CLEAR TO OTHERS THAT THEY ARE DRIVING A SKYLINE, why not apply the gigantic rear window sticker? You know, in case the guy following you can’t make out the small Skyline lettering under the trunk lid – after all you DO want to make sure the guy isn’t riding on your bumper trying to make out what brand of car that is. And for night – why Nissan also offered an “Electro Luminescent” (EL”) Skyline “rear finisher” (as seen on the red car, page 13). So as you pull away at speed, people can see the electro-blue lighting between the red afterburners. Hmm…. 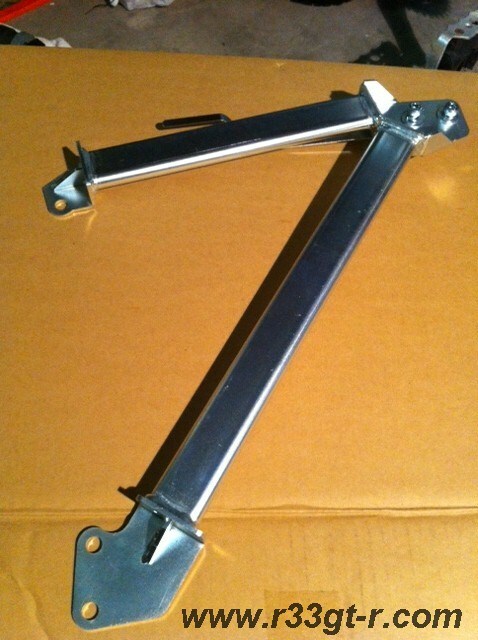 And then of course, some “practical” items such as door edge guards. If I had these on my car, then I would not have had to install those foam pads on my garage wall (really!). 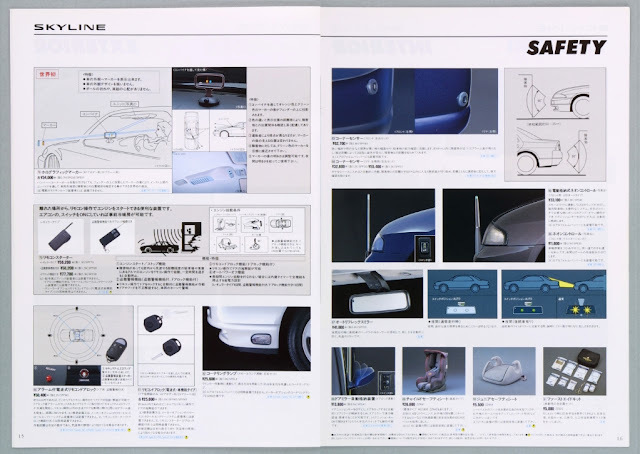 I’ll finish this post with a quick overview of the “Safety” items offered on pages 15-16. Nissan brags about having the “World’s First” “Holographic Marker” system. Apparently, you look through the loop thing that is mounted on your dash, and the projection unit mounted on the roof of the car does its thing, which is to have 2 poles -one green, one orange - appear at the right front corner of your car. This helps you park, without having to install those annoying antenna like things as depicted on page 16. 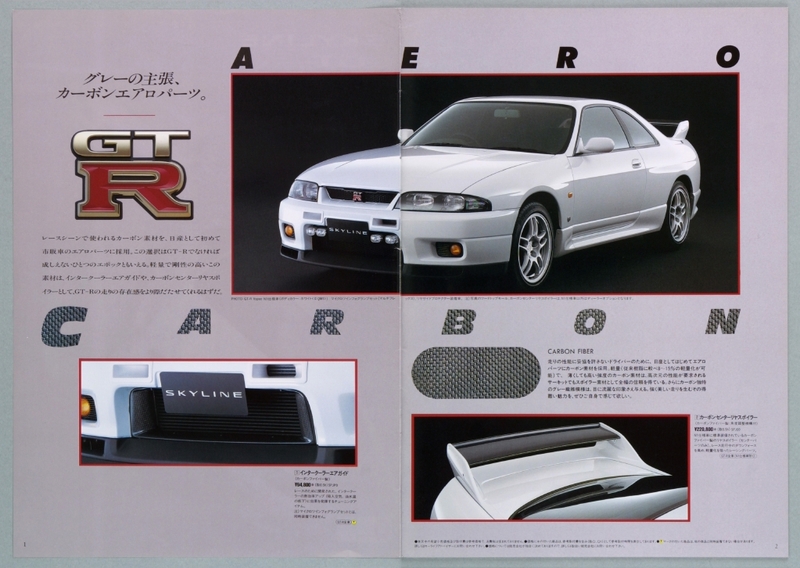 Speaking of parking and safety - the bumper mounted corner sensors on the top of page 16 - the front units were not available for the GT-R, but apparently the rear ones were. Anyone have this on their car? 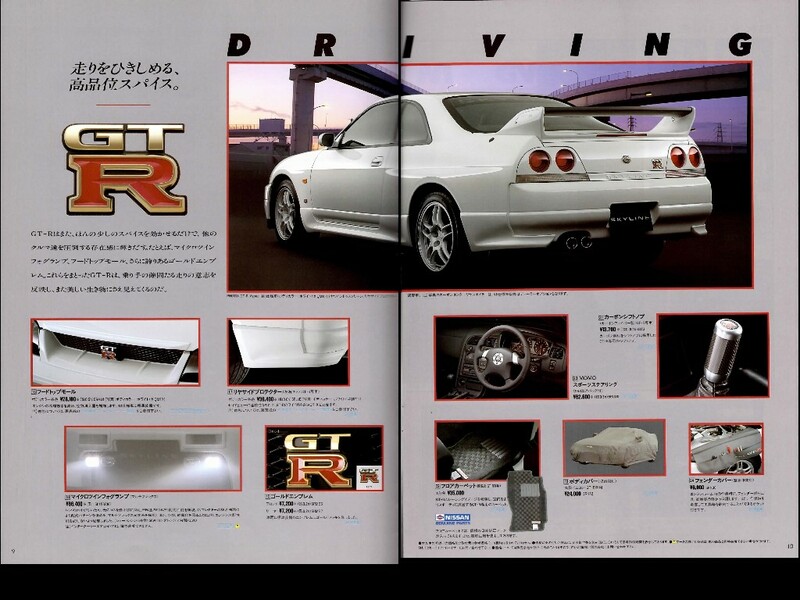 The other items that were available for the GT-R is the auto dimming mirror on page 16. The ones available now are more advanced, with compasses and garage door openers built in for example, but the mounts are different. Hence I guess if we REALLY want one of these, we are stuck with one of those older units? Anyway, there are other items, most of them are pretty obvious, but if you have questions on any of them, feel free to drop me a line in the comments section. Stay tuned in a few days for an overview of the interior options! Well, it was bound to happen. It's so easy - relatively brainless, actually - to post to Facebook. And I'm always coming across little bits and pieces that just don't quite make these pages. So I decided to make a Facebook page dedicated to R33 GT-Rs. Please check it out and "like it" if you DO like it! Otherwise please send me a PM and tell me what's wrong, how it can be improved, etc. I'm also hoping that some of you can send in some original photos that we can post on the page! With some help from everyone, I'm sure we can make it the premier R33 GT-R Facebook page (although at this point, probably the only? LOL). 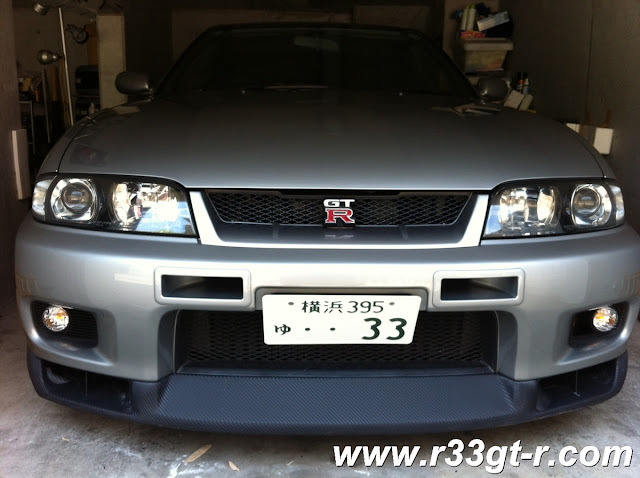 At the moment, another active R33 GTR blogger, Matt from Project BCNR33 , my buddy Neal (a fellow BCNR33 owner here in Japan) and John Chu from GTRCanada.com are helping me get the page up and running. Thanks guys! We've been sorting through material, and the more original, the better! In fact, our policy is that we will not normally post things unless we have permission to do so or the items are in the public domain. 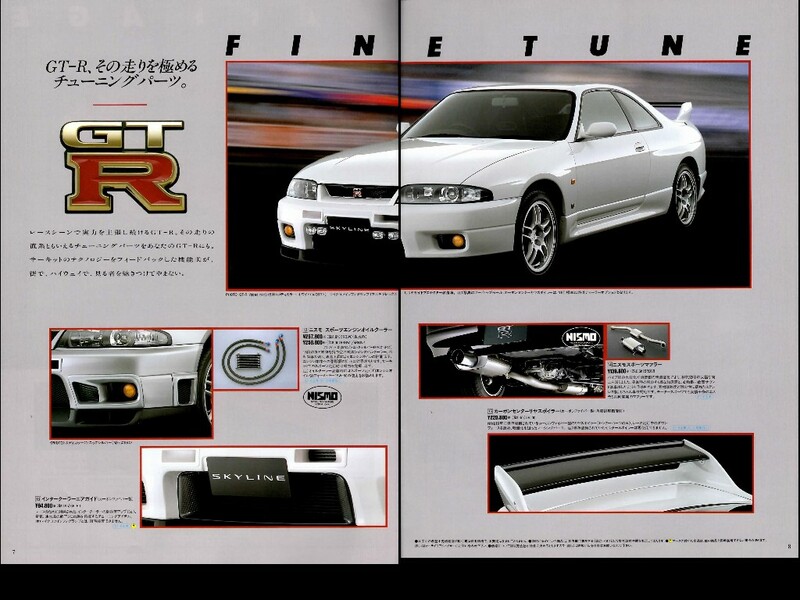 Too many car related website/pages do that, and I'd like to be able to showcase the R33 without crossing that line. Finally - anyone else who's got the time and access to some great material, please let us know if you might be interested in being an administrator for the page! Enjoy and see everyone out there!